At the animal crematorium near us, you can watch your pet’s body enter the flames through a glass wall. Behind the conveyor belt carrying your pet’s corpse toward the oven is a giant mural of “animal heaven,” an idyllic landscape of mountains, river and flower carpeted valleys. Fluffy clouds drift across deep blues skies spliced by an outsized sparkling rainbow. Butterflies and birds flit about. Sheep gambol on the hills. Dogs play with sticks and roll in electric green grass. Cats chase their tails. And horses joyfully charge across the landscape at full speed. There is not a human to be seen. Messages from owners are scrolled across the wall. “We will always love you, Rufus.” “Sabine, you were the greatest cat that ever lived.” Costumers were encouraged to write their final words to their pets in a guest book. Many people asked for forgiveness for putting their pets to sleep. Their messages conveyed real pain. It has become a truism that the passing of a beloved pet causes a puzzlingly deep grief. People talk about the loss of animals’ unconditional love, their loyalty and willingness to please as factors. And pets never really grow up. One of my most loved was a Roman street cat named Uggles. Uggles lived to the venerable age of 24, a remarkable life span for any cat. Nevertheless, he stayed a baby, pre-verbal, full of cuddle energy, and about the same size as a one-month old infant. I felt responsible for him in every way. Had I really been doing my job, he would never die but outlive me, as all infant-like creatures should. Only once in a while did it occur to me that were he my son, he would already have finished college and gone on to establishing a career and possibly a family. There is another pain-exacerbating factor, however, and that is the notion of animal heaven. The traditional thinking is that if animals have souls (which of course they do), their souls do not go where we go after we die but someplace else. And that place is separate from ours, made for and limited to a “lower” consciousness. Animal heaven and the human afterlife at no point connect. There is then, no possibility of meeting again. The mechanisms of animal consciousness are really no different from ours. They, like us, will gravitate toward conditions in the afterlife that are optimum for their wellbeing at that moment. And like humans, they create portions of their afterlives out of the reality they knew in the body. My Turkish street dog, for instance, was taken by my father. She still lives with him, at least part of the time, although they never knew each other in their incarnated lives. My dog’s happiest moments in life were the walks. She was her most exuberant in corn fields, madly scurrying between the stalks sniffing out hares. She still takes those walks with my father. This is not to say that a pet’s afterlife is limited to animal-human activity. They have the ability to expand in any direction they can conceive, just as we have. Nor would wild animals choose such afterlives for themselves. It would be incongruent with what they knew and what they valued. From what I have seen, herd animals join herds, birds join flocks, gazelles range on unspeakably beautiful plains. Yet they possess powers of mobility that far exceed what they knew in the body. Yes, pigs do fly. And they are safe at last from harm. Research based on thousands of afterdeath communication experiences has shown that a full 16% of all afterdeath communication occurs with a person’s pet! What’s more that pet usually shows up with a relative or friend of the person in tow, despite the fact that the deceased human may never have known the pet on earth. Pets are also among the first to greet their owners when they pass. So, answering the question “Is there an animal heaven,” I would say no. But there is indeed an animal afterlife, one they can share with us or not depending on their individual needs and mindsets. There’s a sweet book out on peoples’ real-life experiences of their deceased pets visiting them called Animals and the Afterlife, by Kim Sheridan. Check it out by clicking here. My cat Artoo was run over a few days ago. Of my three cats she was the one I had the closest bond to (her daughter and lifelong companion are still with me). I buried her in the garden where she used to play and relax among the fallen leaves, and next to where I buried the kittens of her brood who did not survive. The following night I went to the grave to burn some incense and convey my love. I took a photograph of the grave to send to my ex girlfriend, who was with me when we bought the original two cats as kittens. But before I could send the picture it began to zoom in and out, and move around of its own accord on my phone screen for around two minutes, and I knew that this was a message to me. As I walked back home from the grave I entreated my father to look after her soul. The following day I noticed that a dry flower that I keep next to my fathers photograph had fallen down (from a position where that could not occur naturally). My ex also revealed to me that she had dreamt of Artoo letting her shower her the night that the cat had died. This is significant because Artoo had never been friendly with my ex in life, and dreams of washing another are supposedly about cleansing relationships. I also tried to play a video that night, which hadn’t completely downloaded. It jumped to a scene of a priest, who said ‘it’s joy’, and then promptly crashed. When I watched the video after it had completed its download, there was no such comment by the priest. Combined, these things tell me that Artoo is with my father in a place of joy. Skeptics might scoff and call these things technology bugs and coincidence – but I’m certain. It does nothing to ease my selfish heartache of missing her presence, but it does ease my grief for her lost life. I used to be somewhat skeptical, but this is now the second experience I have had – with the first being the night after my father passed away. Still miss Artoo dearly, for the short four to five years we had together she had become like a daughter to me. So for anyone who has lost a pet with whom they had a close personal bond, I’m afraid nothing can help the selfish sorrow of wanting them back – but knowing they are in a place of joy brings immense relief and pleasure as you begin to break through that dark place. What a wonderful account of what can happen after a death, animal or human. And of course Artoo is with your father. Xiu, thanks so much for writing your experiences with Artoo. And you are of course right, Artoo is with your father! Consciousness is all the same pure energy material and comes from the same source which is God . 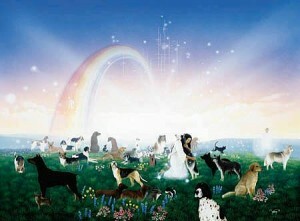 To say definitively that animals do not to heaven is a very misleading understatement. Consciousness is pure energy and once it exits its physical shell it isn’t sorted and separated because it inhabited a different body on earth . All consciousness / souls are made from the same God fabric . Only the physical encasements / bodies are different in which all souls inhabit during their physical experience on earth . I am confident there is a very special place for them and they’re not separated based on physical encasements their souls inhabited here on earth . I was wondering if you have any thoughts on the possibility of an animal having a NDE, subsequently changing it’s very nature and instinctual patterns.